On Christmas Eve I visited Bisbee, Arizona, with Tara's family to visit the historic copper producer in southern Arizona. From 1875 to 1975 the Copper Queen Mining Company (under the direction of Phelps Dodge and the Calumet and Arizona) mined copper, zinc, manganese, silver and lead. Presently, the town has kept its charm while attracting artists from around the world. Walking around Bisbee is one of my favorite activities. There are many historic buildings, staircases and alleyways to explore. Make sure to check out the Copper Queen Hotel and the local museum which gives a great history of the copper boom. 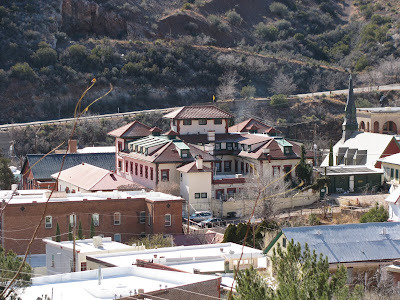 I prefer Bisbee to the ultra-touristy Tombstone to the north. 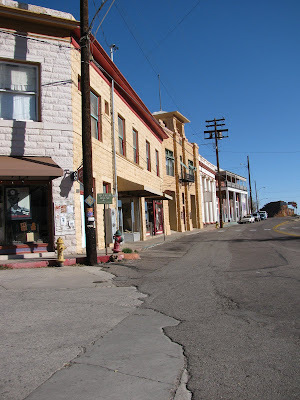 Directions: Bisbee is located 94 miles south of Tucson on State Route 80 north of Douglas, Arizona, on the Mexican border. Brief History: The boom began in 1875 when a US Army scout John Dunn staked a claim in promising rock he thought contained copper. Dunn put Warren in charge of the claim . Warren advertised the find and miners came in from around the United States. At first minimal smelting was done in the district and it was profitable to send the ore to Pennsylvania. In 1881 the Copper Queen Mining Company was struggling to make a profit. Douglas, on behalf of the Phelps Dodge Corporation, brought the Copper Queen Mine. Phelps Dodge responded by building a state of the art smelter in Douglas and a railroad line as well. Phelps Dodge worked hard to turn around the lawless behavior of the men and the unsanitary conditions in the camp. Prior to 1881 it was common for men to work at the mines enubreated. A row of prostitute houses lined Brewery Gulch which facilitated the problem. The new company forced the houses to the periphery of Bisbee and instituted harsh policies on the miners working under the influence. In the early 1900s the Warren District was also known for instituting safety measures which led to less injuries. Finally, sanitary improvements limited Typhoid and Dysentery outbreaks. Bisbee had its share of disastrous fires and floods. In 1906 and 1907 major fires destroyed residences and businesses along Main Street and Brewery Gulch. The 1907 fire was the biggest fire actually causing the mines to close while the miners could dynamite a firebreak. After the 1907 fire Bisbee created a fire department and state of the art fire truck. 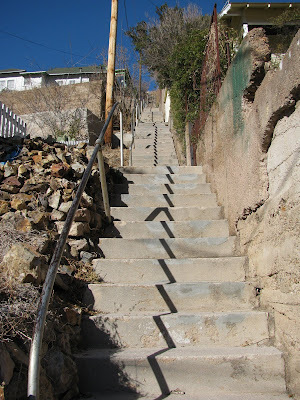 Because of the lack of tree coverage in the hills around Bisbee, every year floods still ravaged Bisbee causing major damage. In the 1900s the Warren District would be known for the number of nationalities which worked its mines and strict segregation. England, Sweden, Germany, Mexico, Slovenia, Serbia, Italy all had workers in the area however, they were segregated by their job. Drillers and engineers were mostly dominated by Cornish and northern Europeans. Muckers were dominated by Central Europeans. Hispanics were not allowed in the mines and worked above ground in the smelters. Chinese were not allowed to stay in town after daylight hours. They could stay during the day to sell produce but were arrested if seen after dark. 1917 was an important year for the Warren District. First, Phelps Dodge brought out the Calumet and Arizona Mining Company becoming the dominant power. 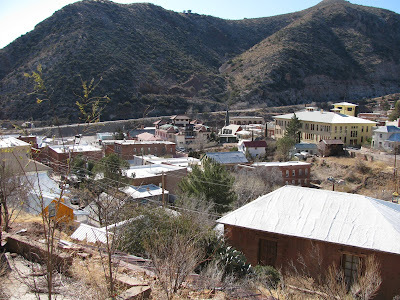 Second, the Sacremento Pit opened becoming Bisbee's first open-pit copper mine. Third, the deportation of strikers led by the Industrial Workers of the World (IWW) put a permanent stain on Bisbee's history. They were rounded up by law officers and sympathizers. The strikers were loaded into cattle cars and shuttled into the New Mexico desert.